We’re continuing our journey through a writing unit focused on the patterns of great writing. This lesson, number three in the series, covers commonly used themes. These lessons assume an understanding of the depth and complexity icons as well as the content imperatives. Students will categorize stories according to a repeating pattern of themes using a variety of films, novels, short stories, and video games. Ask students if they have ever heard of a story where someone begins as a good person, is corrupted, and then returns to good at the end? Solicit examples of stories with this patter. Allow a lot of thinking time as your students make connections. There are only a few themes authors choose from and they are repeated throughout history. This is another example of the generalization “structure increases creativity” in writing. Authors pick a theme and then build creatively around it. My 6th graders are fluent with the idea of an “author’s message,” so I don’t spend too much time definining “theme.” The introductory hook is typically enough. With younger students, you may need to introduce this concept (perhaps as its own lesson). Explain that a theme is the big idea that the author is exploring in his writing. It is not stated directly in the writing, but instead we must infer the theme based on evidence. Definition: A character begins as a hero or otherwise “good” person. Through some event, the character becomes “bad.” This is the fall from grace. The character then earns back their good standing through selfless action. This is the redemption. It’s possible, of course, to have a story about a fall from grace with no redemption or redemption without a fall from grace. A selfish act destroys the protagonist’s reputation. The protagonist returns to the hero status through selfless acts. Definition: The protagonist is on a mission to find a place, a person, or an item. During the journey, the main character experiences a change over time. The Lord Of The Rings – Frodo must reach Mordor to destroy the ring. The Wizard Of Oz – Dorothy must reach the Emerald City so she can return home. Definition A character grows up and loses their childish ways. This may mean taking on new responsibilities or realizing that something isn’t important. The loss of innocence theme has a more negative view of this transformation while a coming of age story is positive. Naturally, you know which stories will work best with your class. They sort these into theme categories, giving an explanation of how the story fits with the theme. This would then be shared out and we would note any differences among groups. It is reasonable that one story could fit under multiple themes. I give students an assortment of settings – pictures taken from Flickr’s most interesting photos of the week. Students pick one setting and a plot summary using one of the themes we introduces. This plot should follow the dramatic structure presented in the previous lesson. 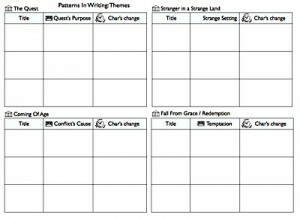 Now that we’ve introduced patterns in plot structure and themes, students will be examining the types of characters that populate these stories.